Usually they just pass by while keeping a distance, or disappear into the dunes until we have passed. The last thing they want it seems, is meet other loners. But not this person. She called her dog back, and asked him to heel. Judging the outdoor clothing it was definitely a dog enthusiast approaching, complete with the obligatory sleeveless jacket with four stories of pockets filled with dog toys. The bottom of the jacket was discolored by the many layers of muddy paw prints it had collected over time. The leash was casually hanging over her shoulder as a finishing touch. She could have stepped right out of a dog training magazine, and my guess was she was going to attempt to walk passed us with her dog in a perfect heel, or at least she saw it is a training opportunity with distractions and we seemed invited to be the distraction for the occasion. I crossed over to the opposite site of the beach. The girls were playing with each other, like they usually do. When there would be enough distance between them and us, they would keep on playing together too I knew. The dog was huge. I guess it was a young male because he kept his eye on the girls in between the rain of treats he got from his person for heeling. They almost made it passed us, until I heard the person erupt into an attempt to recall, "Thor, Thor, THOR!" while quickly pulling dog toys out of her pockets and waiving them high up in the air. But Thor had only one thing in mind, and that was to say hello to the girls. 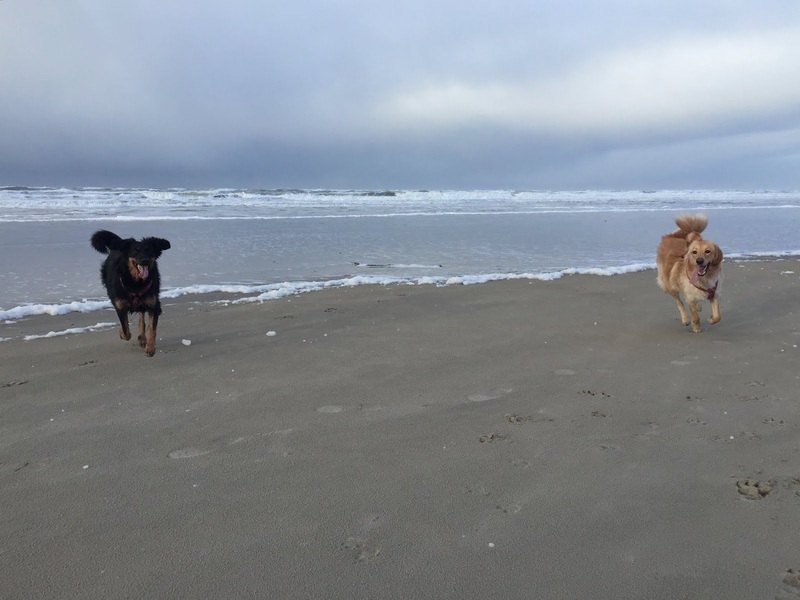 When he passed the middle of the beach, I knew the girls would not ignore him any longer. Zerline stopped playing, looking alarmed at Thor approaching. Tilde quickly took the lead and ran out to meet Thor. Poor boy, he was young I could see and I knew Tilde would force him to greet Zerline on her terms. He was twice her size, but half the attitude and Tilde's stinky eye didn't went misunderstood. Thor stopped in his tracks, and kept as still as possible. Now Zerline went over to investigate. First when she was ready, Tilde dropped the stinky eye. Tilde impresses me with her style. She takes care of her sister like Kenzo would have done, if he would have been here. But with Kenzo it would have been so obvious, so easy to spot with the naked and untrained eye he was protecting his family. Tilde does it a lot more subtle, although she can also pull a stinky eye if necessary. Thor became playful again and attempted to run after Zerline, which Tilde stopped by simply crossing his path. A small distraction, but enough. Tilde can be bitchy, but she can also use her wit, finesse and charm to help her sister. With everything good between the girls and their newly made friend, I looked up and expected Thor's person to approach, but to my surprise I couldn't see her at first. Then I noticed her again. She was running further down the beach. No doubt yelling after Thor, but her voice was muted by the wind. I realized what she attempted to do. It was textbook dog school, "when your recall isn't working, run the other way." I must have heard it a thousand times from all the trainers we have had over the years. Thor was playing a little with the girls, who had started to roughhouse him, but he was that huge, it didn't seem to bother him and certainly not knock him off his feet. His person had opened the next chapter in the textbook, and she was now laying flat on the beach, while waiving dog toys. If Thor would only have looked her way. I started walking towards her, just enough for Thor to remember who he had come with and for him to make a run back. She celebrated his return. "Excellent," I thought, they will get there one day these two. Great story. Tori has definitely taken on the protector role, the enforcer, the one who jumps in the middle when our new foster puppy gets too wild. Excellent indeed! Love how they both handle themselves. Very cool!